Resident Foodies say: We got a real treat today, and it was free. 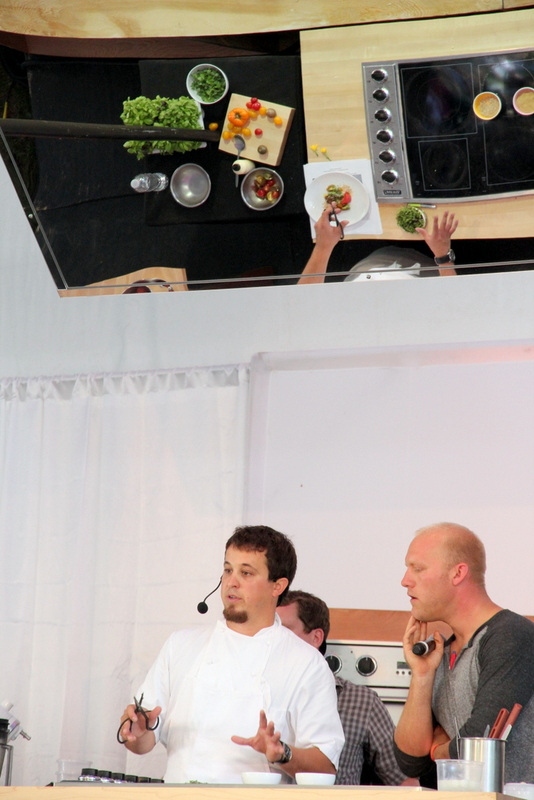 Chef Danny Grant, formerly of 2 Michelin-starred Ria (now closed), gave a cooking demonstration at Chipotle’s Cultivate festival in Lincoln Park. 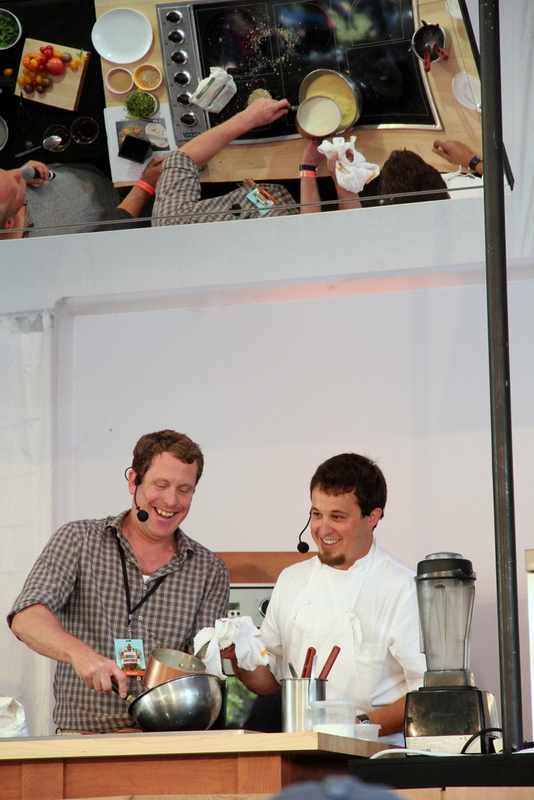 Grant was one of several big-time Chicago chef to participate in the food/music show, which was meant to highlight the farm-to-table and use of sustainable ingredients in restaurants. 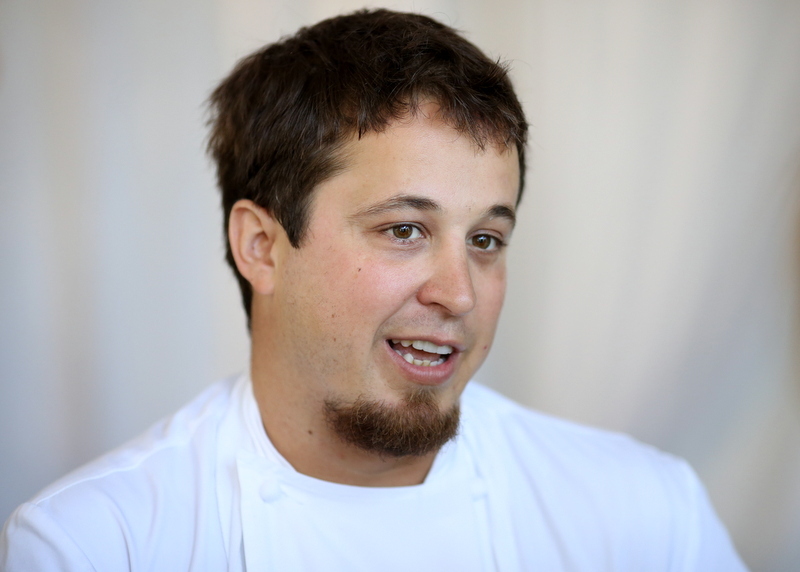 Food and Wine selected Chef Grant as one of the Best New Chefs of 2012, and we can see why. His food is incredible. First tasting: For the first tasting, Chef Grant prepared cheese curds (aka cheese balls) deep fried in a panko crust. The cheese was a petit frere cheese from Wisconsin’s Crave Brothers. He also used what he called the “meth,” but we missed what he said was the actual ingredient. Whatever it was, it tasted good. 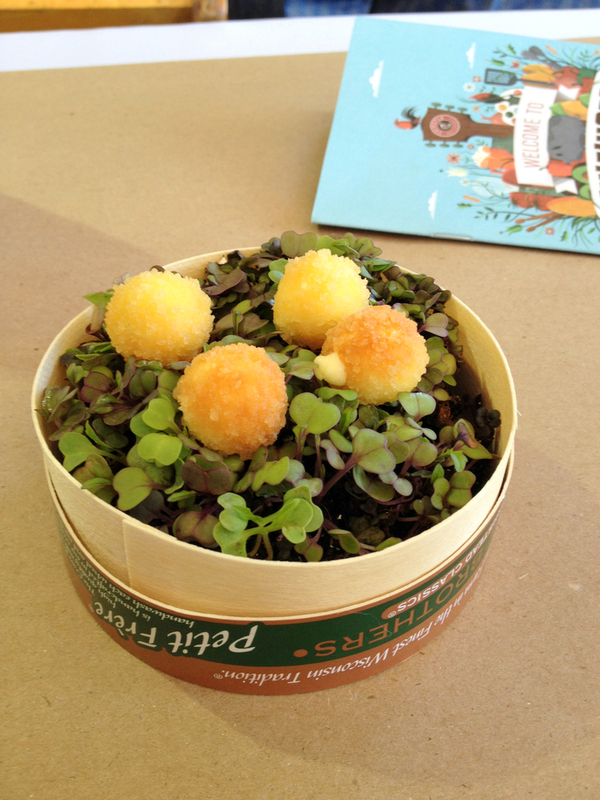 For the plating, Chef Grant used the actual cheese box from Crave Brothers to serve the cheese balls on a bed of greens. The cheese balls were small, but downright delicious–they had a nice crunch that led to a delightful taste of cheese. 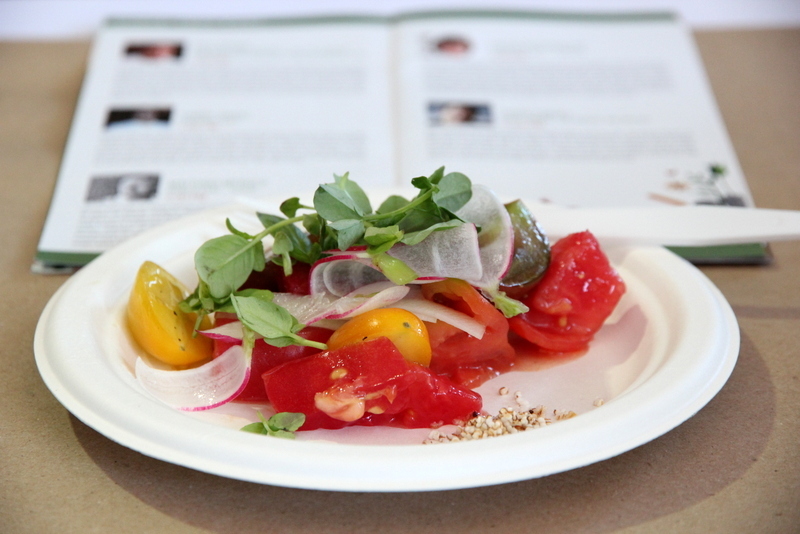 Second tasting: As if one dish was not enough, Chef Grant treated us to a second tasting–heirloom tomato salad. The salad was so fresh and amazing for a late summer Saturday. The best dish of the day! 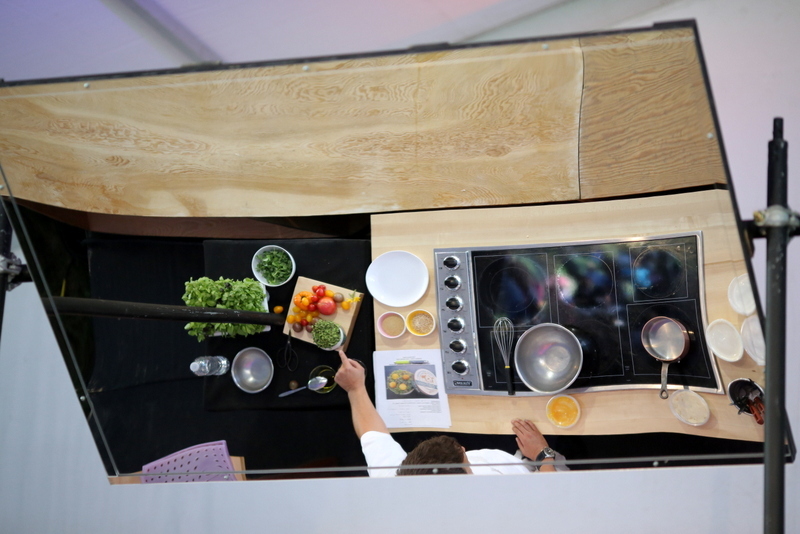 We especially liked the over-the-counter cooking mirror that showed the audience all of the chef’s moves. That was neat. 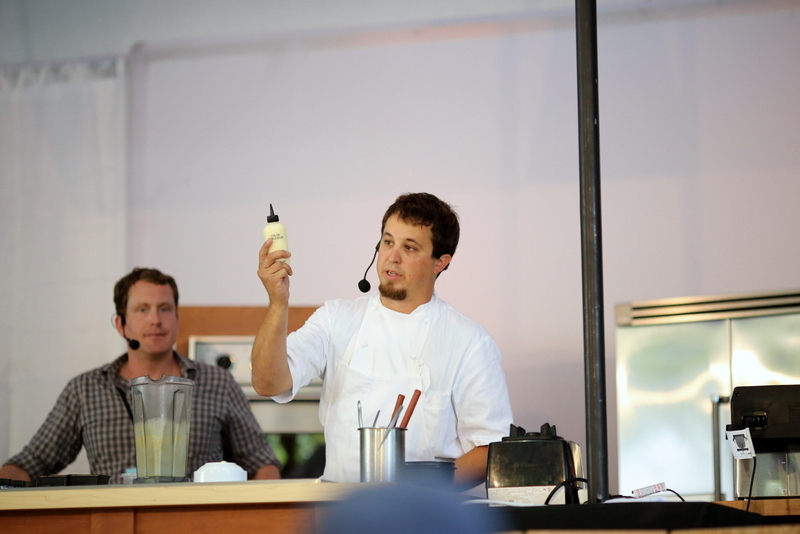 Chef Grant said he’s still enjoying his time off, but hopes to make his next move soon. We got the chance to chat with him after the show, and he’s very friendly, humble, and down-to-earth, especially for a chef of his acclaim. In anticipation of Thomas Keller’s latest cookbook Ad Hoc at Home, the NYT has a poignant article, “What the Last Meal Taught Him,” by Kim Severson. The article recounts Thomas’s reunion with this father in 2006 after the two hadn’t seen each other since his father left him at only age 5. After the reunion, Ed Keller moved to live next to Thomas, in a house next to the French Laundry–signalling the strong bond that the two had quickly formed. However, a tragic car accident in 2007 left Ed Keller a quadriplegic. Yet, for over a year, Ed, a former marine, battled on until his death in 2008. Thomas Keller’s upcoming book “Ad Hoc at Home” is described in the article as more personal than his previous books. Can’t wait to take a look! It has just hit bookstores (at least Amazon!). Resident Foodies reviewed Keller’s restaurant Ad Hoc–for which the book is named–back in 2007. This was our first restaurant review ever. Frankly, the video quality is not so impressive. But we weren’t trying to impress anyone. We made the video just for fun! Today, we’re a little bit more serious (and hopefully better at video editing), but we are so glad to have our start associated with Thomas Keller’s Ad Hoc. For our start as Resident Foodies (TM) was truly ad hoc! Interview from July 22, 2008. Yet David Chang still remains one of the hottest chefs in the US. Based in NYC, Chang has quickly built up a “Momofuku” empire– Momofuku Noodle Bar, Momofuku Ko and Momofuku Ssäm Bar. The first Momofuku cookbook will be out later this month, written by David Chang and NYT writer Peter Meehan. Can’t wait!